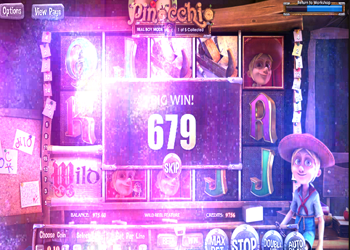 Pinocchio is one of BetSoft Gaming’s latest video slots. Like most of their titles, it has been developed using stunning 3D graphics, and is a treat to play. Things may look a little compact at the bottom of the reels, but we’ll soon sort that out for you, in our online slot reviews of this game. This Pinocchio slot isn’t based on the Disney movie, but more on the original fairy tale. 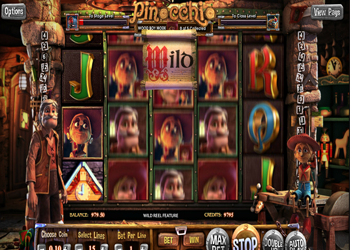 Players on older computers and browser may not a slight delay in speed when the reels spin, but downloading the slot will alleviate that issue, allowing you to play Pinocchio comfortably, and enjoy the full Pinocchio gaming experience that BetSoft Gaming intends you to have. Now, at the bottom of those reels are a lot of options. Some are self-explanatory, such as the max bet button, and auto play option which allow you to play consecutive spins. We’ll bypass those and go straight to the good stuff. The coin value button can see players adjust the size of their coins from 2p up to £1 in total. They can then use the line bet button to stake between 1 and 5 of these coins per line. Then, the player can choose how many of the slots 15 paylines they wish to play. When you adjust the bets, the counters under the reels will reveal what your current stake is. Minimum and maximum wagers in Pinocchio stem from 2p per line, per spin, up to £75 per spin, respectively. Plenty of thematic icons are present in Pinocchio. A clock, a poster and a cage are just a handful of them. The more thematic icons that appear in this video slot will offer players winnings that range from 50 coins up to 2,500 coins per spin. The biggest wins are reserved for the two wooden doll icons (which appear to be Pinocchio and a real boy). Lower paying symbols are also present in Pinocchio, and as you might expect, they are the high playing card icons. These symbols look great in 3D, but no matter how good they look, they still only offer you prizes which range from 25 coins up to 500 coins. Pinocchio does contain a lot of symbols, and that lessens your chances of success. Fortunately, most of those excess symbols trigger special features, where you really can pocket big prizes. There are many wilds in this slot, but they appear in many different features, too. Pinocchio is stocked with special modes and bonuses, as you’ll know see. Pinocchio is actually played in a number of different settings (Geppetto’s workshop, the Stage and the Classroom). 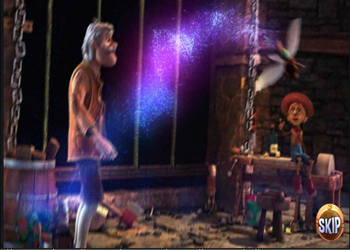 The base game takes place in Geppetto’s workshop. When in this setting, if a player lands a Geppetto symbol on the third reel, it becomes a walking wild, moving from right to left, offering re-spins as it goes, until it disappears from the first reel. If a player lands the wagon symbol on second reel ten times, the Stage Bonus is activated. Similarly, if they land 10 book symbols on the fourth reel, they’ll trigger the Classroom Bonus. These settings offer 8 free spins each. The Stage Bonus offers a sticky wild for 5 re-spins, when the wagon icon appears on the third reel. The Classroom Bonus offers a wild which descends down a reel until it disappears, every time a book icon appears on the first, third or fifth reel. To begin with, all players will start out in Wooden Boy mode. However, if five real boy icons are collected then the Real Boy mode begins. In this bonus, all wooden boy icons become real boy icons and acts as wilds, replace all other symbols, save for the setting scatters. At any point in the game, a fairy may appear and re-spin one of the reels. Why? This feature allows players to pocket up to 5x multipliers, by landing symbols on the first, third or fifth reels. It’s not going to blow you away, but it certainly is a nice addition to the slot. Pinocchio is stocked with special features, but that only means there is plenty for you to win. You can try your hand at this new BetSoft title at Guts Casino today, where you can also pocket a £300 welcome bonus, as well as 100 free spins, when you sign up and make your first deposit as a new player.